Gary Miciunas, Principal of Advisory Services at NELSON, will be presenting our Work Design Magazine / IFMA Workplace Evolutionaries Webinar this Thursday, March 20, at 11:00 am EDT. The topic is “The Relationship Between Office Design and How People Work,” and Gary plans to draw on points laid out in this article, originally published on November 8, 2013. Click here for tickets. If there was a Pictionary for the office alphabet, the letter “C” would clearly have been reserved to depict work life in the infamous “cubicle” that was so ridiculed in the Dilbert cartoon strip. The demise of the cubicle was long overdue and we can thank Scott Adams who buried it to rest in peace. Today, the hot topic of “coworking” might be a contender to replace “cubicle” in a new edition. While coworking may be one harbinger of the future workplace, it is the integration of three C’s that is redefining workspace: concentration, collaboration, and community. The relationships between and among these three C’s are critical to support new ways of working and achieve target metrics of a high-performance work environment. Most established corporate clients are clamoring for more “collaboration” space in response to business initiatives requiring project rooms for cross-functional innovation aimed at breaking down the inertia of organizational silos. What most clients do not initially realize is that adding more of this type of space without reconsidering status quo practices of how space is currently allocated will only result in floor area metrics of square feet per person and square feet per seat that are bloated. We often hear that space is fully assigned and more is needed to meet these needs. Increasingly, studies show that assigned space goes highly under-utilized half the time. By any “lean management” standards, this is an unacceptable waste stream that must be eliminated. So, before we respond by adding more collaboration space, the first strategy must be to reconsider the space devoted to “concentration” for individual work in private offices and open plan work stations. In a traditional office build-out, as much as two-thirds, or approximately 70 percent, of the space is allocated to individuals. That leaves one-third, or approximately 30 percent, for shared support space including collaboration and community settings. This 70/30 ratio is becoming history and sustaining this key metric going forward cannot support new ways of working among a highly mobile workforce whose internal mobility within office buildings is having a greater impact than external mobility beyond company premises. The new ratio that is emerging is approaching 50/50. NELSON’s “benchmarking matrix”, which shows the ratios for each office type. Each illustration is a plan from one of NELSON’s recently completed projects. One of two financial services examples. A second financial services example. A digital media services company. In addition to a greater need for collaboration spaces, there is increasing recognition that socialization at work, building trust through social networks across an organization, and expressing core values are all critical to creating a sense of community. Employer branding targeted internally to employees is becoming as important as branding targeted to external audiences. To put this in practical terms and metrics, the traditional office built out at the 70/30 ratio noted above typically yields an area allocation of 250-300 square feet per person. In this traditional scenario, space is allocated on a 1:1 Persons-to-Seats ratio, so the same figure of 250-300 square feet also applies to area per seat. Traditional allocation provided private offices for approximately one-quarter of the population with the remaining three-quarters working in open plan. Aggressive strategies in large real estate portfolios are targeting 100 square feet or less per person and 200 square feet or less per seat including concentration, collaboration, and community spaces. Obviously, these new metrics can only be achieved through aggressive reduction in footprints for individual work (concentration) and/or aggressive Persons-to-Seats sharing ratios beyond 1:1 in order to move the overall 70/30 ratio toward 50/50. This trend is best illustrated in a series of current design solutions for typical office floors across a variety of industries including financial services, technology, digital media, risk management, and healthcare. In these examples, the net impact on area allocation indicates that only one in ten individual spaces is a private office and ninety percent of individual spaces are open plan work stations in footprints as small as 36 net square feet. Together, total “concentration” space for private offices and work stations comprises 50 percent of the total space on the floor. The other 50 percent comprises collaboration and community shared spaces with a higher percentage enclosed with full-height, floor-to-ceiling partitioning. Many of these spaces better facilitate conference calls, remote video or sequestered production tasks. In this 50/50 scenario, for every individual concentration seat, there is one shared seat to support collaboration and community. These metrics and strategies also reflect a fundamental rethinking of the conventional cubicle. In the past, an attempt was made to accommodate all work activities within a standard footprint and everybody got one. This resulted in some combination of limited meeting, filing, focused computer work, telephone and general work surface and storage. It also meant that people mostly sat all day in their cubicles, yet half the time we would not find them there. The current focus on wellness and well-being at work encourages movement. Activity-based settings that break apart the functions of the cubicle require people to move around throughout the day. Increasingly, they have the technological mobility to do so more freely with untethered connectivity and telephony. The challenge is to optimize square footage across the “three C’s” rather than increase it by leaving concentration space as is, and simply adding collaboration and community settings to an under-utilized space allocation program. This article was originally published on November 8, 2013. Exciting article and a great way to start the morning! 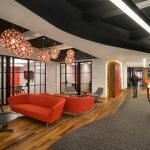 I’ve developed a passion for workplace design over the past few years and I love seeing what designers have come up with while following the direction that workspace design is headed. However it is common knowledge that workspace and ergonomics go hand in hand. We must not lose sight of this. I have experienced the results of both successful and failed open floor plans. Form AND function should work together rather than form “versus” function. Also, a huge part of the problem is the lack of knowledge of how to use and appreciate the new space. Implement post-move tours or training perhaps? Going back to the basics of how people can ultimately be more productive (i.e. high performance), efficient, healthy and comfortable at their workstation, I suggest there be 4 C’s defining the success of the future workspace: Concentration, Collaboration, Community and COMFORT. Ergonomics after all, is the “science of work” … designing for “human abilities, human limitations and human characteristics that are relevant to design” as defined by the BCPE. Excellent piece and a pleasure to read. We are still in the early stages but it is refreshing to see reflected in your article that the “one size fits all” mentality driven by the economy shift and lack of integrated approach is getting light and attention. Awareness and application of sound planning, communication, design and integrated workplace strategies will only benefit our industry and clients.